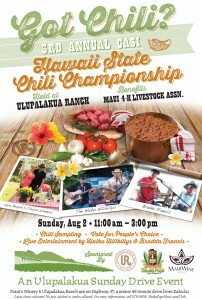 Sha­ka Pops Maui is proud to be a spon­sor of the 3rd CASI Hawaii State Chili Cham­pi­onship at the Ulu­palakua Ranch Store & Grill on Sun­day, August 2, 2015. To like us on Face­book click here! Escape the sum­mer heat and dri­ve upcoun­try to expe­ri­ence heat of a dif­fer­ent kind. 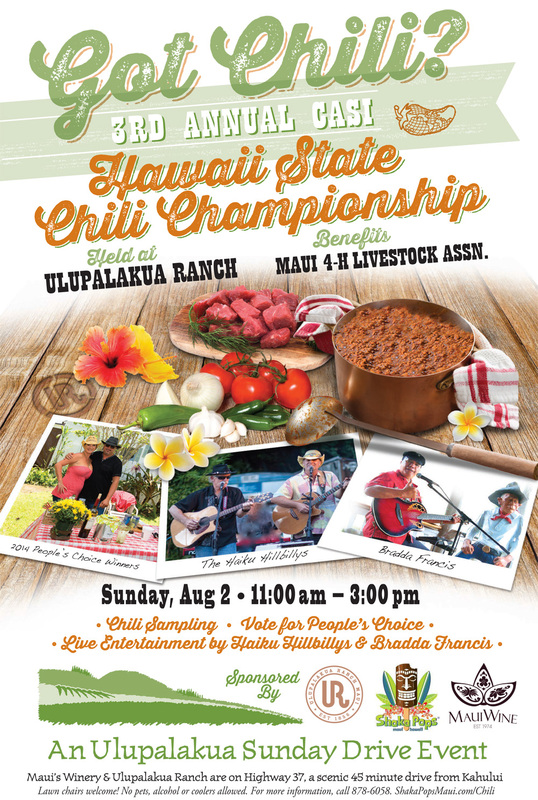 The third annu­al Chili Appre­ci­a­tion Soci­ety Inter­na­tion­al (CASI) Hawai‘i State Chili Cham­pi­onship Cookoff will be held on Sun­day, August 2, 2015 at Ulu­palakua Ranch from 11am to 3pm. 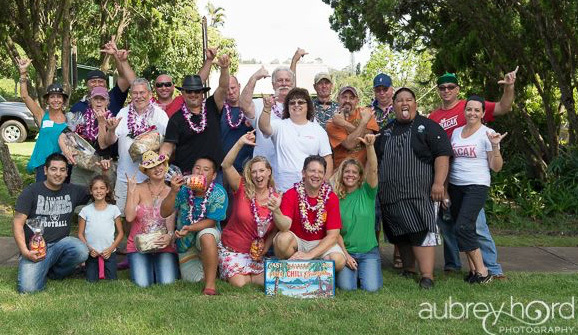 The cookoff will be the focal point of the Ranch’s free “Sun­day Dri­ve” event at Maui’s Win­ery that brings hun­dreds of locals and vis­i­tors upcoun­try to enjoy a day of food, fun and local enter­tain­ment fea­tur­ing music by the Haiku Hill­billys and Brad­da Fran­cis. There will be two chili cat­e­gories, CASI Rules Chili and People’s Choice Chili, both which must be cooked on site the day of the event. CASI chili must be pre­pared from scratch (no com­mer­cial chili mix­es) and con­tain no dis­cern­able fillers (beans, rice, pas­ta, veg­eta­bles, etc.). “Any­thing goes” for the People’s Choice cat­e­go­ry, so the more adven­tur­ous chili enthu­si­asts can par­tic­i­pate with­out feel­ing lim­it­ed. Vis­i­tors can watch as avid home chili cooks and busi­ness­es like 808 on Main, Charley’s Restau­rant & Saloon, Maui Brew­ing Com­pa­ny, Iron Imu BBQ, and Whole Foods bat­tle for chili suprema­cy with their best “bowl of red.” In adher­ence to CASI rules, the chili is tast­ed blind and is judged on five cri­te­ria: Aro­ma, Red Col­or, Con­sis­ten­cy, Taste, and After­taste. The CASI judg­ing table will include May­or Alan Arakawa, restau­ra­teur Karen Chris­ten­son of Mama’s Fish House, and Exec­u­tive Chef Isaac Ban­ca­co of the Andaz Wailea Resort. A num­ber of judg­ing seats will also be open to the gen­er­al pub­lic on the day of the event. A selec­tion of prizes donat­ed by event spon­sors Ulu­palakua Ranch Store, Maui’s Win­ery and Sha­ka Pops will be award­ed to the ten high­est fin­ish­ers includ­ing a hand-paint­ed cook stove for the Hawai’i State Cham­pi­on. 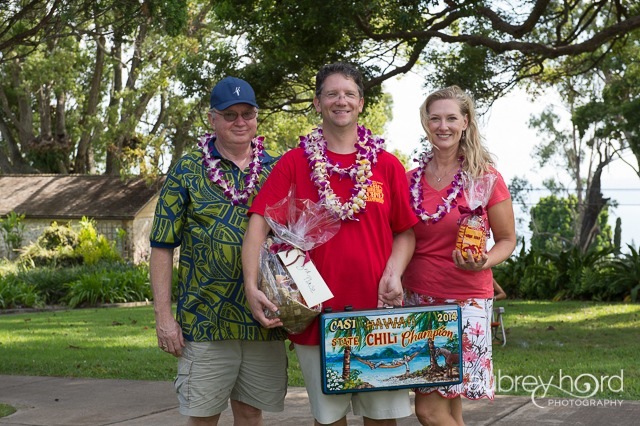 The top three Hawai‘i res­i­dent cooks qual­i­fy to com­pete at the leg­endary Ter­lin­gua Inter­na­tion­al Chili Cham­pi­onship (TICC) in Texas on Novem­ber 7, 2015. In the People’s Choice cat­e­go­ry the pub­lic will have the oppor­tu­ni­ty to vote for their favorite chili. The Maui 4-H Live­stock Asso­ci­a­tion will be sell­ing tast­ing kits ($5 for 5 chili sam­ples) with all pro­ceeds ben­e­fit­ting the non-prof­it orga­ni­za­tion. Pub­lic sam­pling runs from 12:15pm to 2:00pm and win­ners will be announced at 2:30pm. Ulu­palakua Ranch Store & Grill exec­u­tive Chef Will Munder will be serv­ing up ono grinds fea­tur­ing ranch-raised beef, elk and lamb burg­ers and oth­er spe­cials from 10am to 5pm. The Maui 4-H kids will be sell­ing Sha­ka Pops, with $1 from each pop going to the 4-H. There will also be kei­ki and adult pop­si­cle eat­ing con­tests begin­ning at 1:30pm. As this is a fundrais­ing event, no out­side food or bev­er­ages are per­mit­ted and the pub­lic is invit­ed to bring low back chairs or blan­kets to enjoy the enter­tain­ment. CASI is a non-prof­it orga­ni­za­tion that pro­motes chili appre­ci­a­tion and rais­es over $1 mil­lion annu­al­ly for local char­i­ties and its schol­ar­ship fund. Now in its 49th year, CASI sanc­tions over 500 U.S. and inter­na­tion­al cookoffs each year as qual­i­fy­ing events for the Ter­lin­gua Inter­na­tion­al Chili Cham­pi­onship. Pro­ceeds from the event will ben­e­fit the Maui 4-H Live­stock Asso­ci­a­tion. CASI is a non-prof­it orga­ni­za­tion that pro­motes chili appre­ci­a­tion and rais­es over $1 mil­lion annu­al­ly for local char­i­ties and its schol­ar­ship fund. Now in its 49th year, CASI sanc­tions over 500 U.S. and inter­na­tion­al cook offs each year as qual­i­fy­ing events for the Ter­lin­gua Inter­na­tion­al Chili Cham­pi­onship. Vis­it www.chili.org for fur­ther infor­ma­tion. Con­tact larry@shakapopsmaui.com or call 808–442‑2795 with any ques­tions.